You are here: Home / Podcast Episodes / Fiction and Espionage – University of Edinburgh Intro. Fiction and Espionage series introduction by University of Edinburgh’s Penny Fielding and Simon Cooke. Spybrarians, we are in for a real treat. 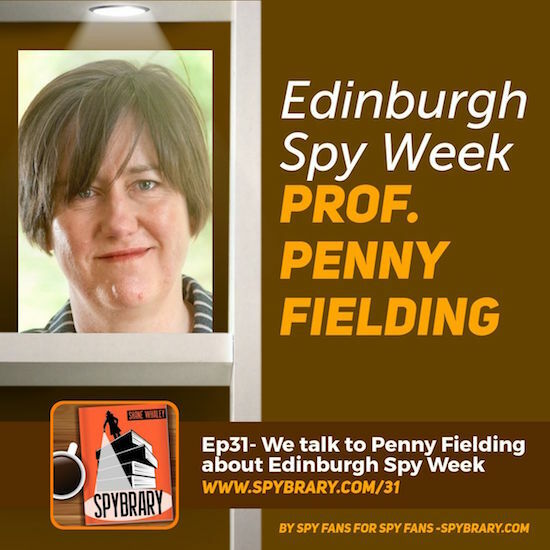 Our good friend Professor Penny Fielding and her colleague Professor Simon Cooke of the University of Edinburgh bring us 5 spy lit podcast episodes which are recorded by students of their Fiction and Espionage course. Penny points out that these are not reviews in the traditional sense, they serve more as commentary, discussions and in some cases interviews with the authors. On today’s episode Penny and Simon give us the briefing and then over the next 5 weeks, Spybrary will transmit the recordings from the Fiction and Espionage students. How cool is this! Below is a transcript of today’s show which serves as the introduction to the Fiction and Espionage Spybrary series. Simon: And I’m Simon Cooke. Penny: And we are two of the organizers of Edinburgh Spy Week. Which is a series of talks and interviews and films and other events here at the University of Edinburgh and throughout the city that we hold every April. And we’re just preparing for our sixth spy week, as we record this. Penny: Simon and I are also organizers and teachers of a course called, Fiction and Espionage. Which can be taken by our fourth year students and also by our mastered students. And the course sets out to look at espionage fiction in the 20th century and right up to the present. Penny: So, we start with some classics that many people would expect to be on the course. We look at Rudyard Kipling’s Kim and talk about how spying was used as a form of knowledge in the empire. We look at Conrad’s A Secret Agent, and think a little bit about terrorism in relation to that course. And try and think about those texts in relation to their historical moment in the early 20th century. 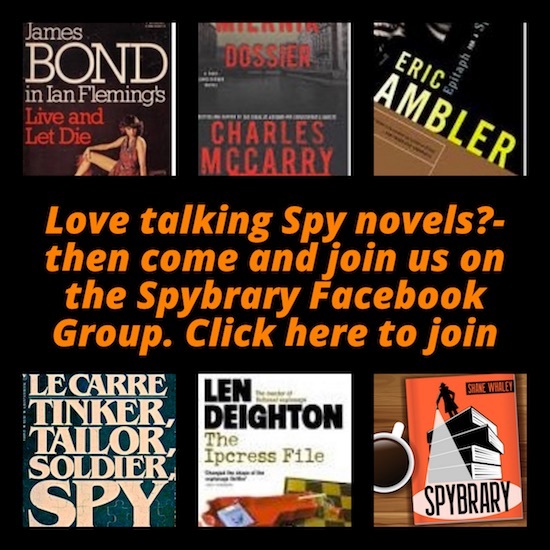 Simon: Yes, and alongside some of the classics of spy fiction, we have some books which perhaps don’t appear on every list of favorite spy novels. Such as Muriel Sparks, The Hot House by the East River. A very avant garde experimental text set in the cold war that engages the questions of how we remember the Second World War and with questions of black propaganda. We also look at the late modernists, Elizabeth Bowens, The Heat of the Day, set in the Second World War. Try to look really at the way that espionage plays a role and is a important feature of a great many fictions in the 20th century that might not necessarily seem to be the first books you think of when you look at spy fiction. Penny: Yeah. We call it Fiction and Espionage rather than spy novels. Because we don’t make a distinction between popular fiction or literary fiction. Although you might want to call that other category. So, we look at literary novelists like Muriel Spark and of course, we also look at Graham Green. Le Carre features heavily and even Fleming. And we end up, we go right to the present day and our last text. And it’s the first time we’ve taught the course. So, we might changed this text. Each year is James Robertson’s, The Professor of Truth, 2013 novel about Lockerbie and the Lockerbie Inquiry. Penny: And part of this course, really important part, is that the students make pod casts. Penny: Yes, that’s right. So, Simon says they’re not reviewing the novels we asked them specifically not to say whether they thought were good or bad, because they’re all good. Penny: Because they’re novels by people who’ve appeared at Spy Week before. So, they’re authors that we know. And the authors very generously offered to be interviewed by our students. Some by Skype, some by email. One in person because she lives in Edinburgh. So, it was really good for us to get the students involved with the ongoing work of Spy Fiction. And to meet, either in person or over a phone line. Some of the authors that have been coming to Spy Week over the years. Penny: And to think about how the work that those authors are doing now, can reflect back on the historical themes of the course. So, we might look at novels written by women. Or we might think about how spy novels might have a distinctive style or can they be funny. On the course, we had Our Man in Havana by Graham Green. And we also had Mick Herron being interviewed by our students who’d read Slow Horses. So, we try to strike a balance between the modern novels and the novels that the students will have read over the course. So, there’s been a very useful exercise I think and it’s made the course a little bit different. Penny: Very interesting for us. And it’s particularly good for us to tie in all the elements of how we work in Spy Fiction. So, what we do as teachers and researchers. What we do with Spy Week. And particularly glad to have this relationship with Spybrary, so we can create the spy readers of the next generation.